Ft Lauderdale skyline #051Y • Condren Galleries Ltd.
Ft Lauderdale skyline #051Y watercolors are metropolis cityscape paintings with prints and JPEG & PDF image scans for reproductions also with a 20% off coupon by artist Stephen F. Condren, BFA-SAIC. Because Ft Lauderdale is new, the skyline is new. 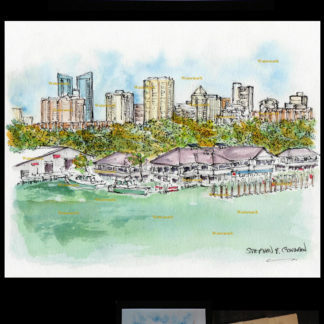 Ft. Lauderdale skyline watercolors by artist Stephen F. Condren. Known as the Venice of the south, Ft. Lauderdale has many canals, one which is depicted here in this watercolor.